San Antonio offices and businesses are always looking for versatile, all-in-one tools that can address and solve different problems. Privacy and branding are common issues among offices and businesses– finding one solution that’s affordable, visually appealing, and effective may seem impossible. Fortunately, decorative window film is highly customizable, offering a high-performing solution that addresses both these issues seamlessly. Decorative privacy window film is available in a multitude of different styles, finishes, colors, transparencies, and much more. From gradient frosted options to fully opaque matte colored films, office and business owners can find the perfect investment for their property. Different gradient directions and designs give the ability to only hide a certain portion of the intended space, making the office feel more open and welcoming. Privacy films can also limit visible light transmissions, allowing property owners to decide how exactly they want their space to look and feel. We’re able to custom cut or print directly on these films to provide effective branding or advertising opportunities. 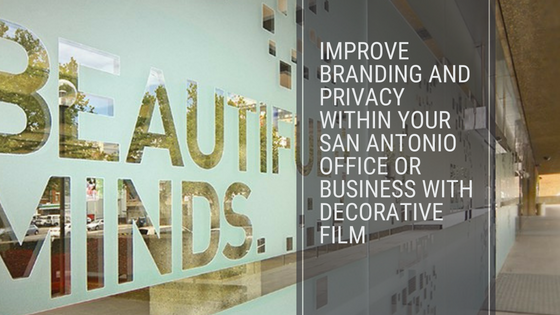 From custom signage to intricate design work, your privacy decorative film can reflect virtually anything your San Antonio office or business desires. GreenLight Window Films is the leading source for custom decorative films and privacy films. We’ve helped numerous commercial clients achieve effective privacy with beautiful, elegant solutions. Our custom printing and cutting services ensure you love your design prior to production. We have the largest inventory of privacy and decorative films, ensuring you’ll find the right one for your San Antonio property. We utilize state-of-the-art computer-aided designs for all of our clients.